Colorado Peak Politics | “ARBITRARY AND CAPRICIOUS”: Court Overturn Of Bloomberg Soda Ban To Come Next On Mag Ban? 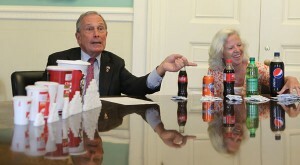 “ARBITRARY AND CAPRICIOUS”: Court Overturn Of Bloomberg Soda Ban To Come Next On Mag Ban? Mayor Michael Bloomberg may have succeeded in successfully pushing through his gun agenda in the Colorado Legislature these last few weeks. But it’s worth remembering that he also succeeded in forcing through his 16 oz soda ban in New York, which was blocked by a judge yesterday, only hours before it was to take effect. It’s hard to ignore the “arbitrary and capricious” similarities between the 15 round magazine limit pushed through in Colorado by Bloomberg’s lobbyist, Adam “Machine Gun” Eichberg, and the 16 oz sugary drink ban pushed by Bloomberg himself in New York. A Democratic insider told a Peak source recently that they think the mag limit will also suffer the same legal fate that the soda ban fell to yesterday. Bloomberg and his billions may be able to strong arm rules and regulations for short periods of time, but our political system has checks and balances for a reason. And the “arbitrary and capricious” agenda of big government liberals like Bloomberg is exactly why. « INSPIRATION: Did Hubbard Crib Talking Points from CO Dems?